You run a manufacturing operation like a finely tuned machine—keeping track of multiple moving parts and ensuring every piece lands in the proper place. Now it’s time to give your resume a similar kind of attention if you want to land top manufacturing manager jobs. 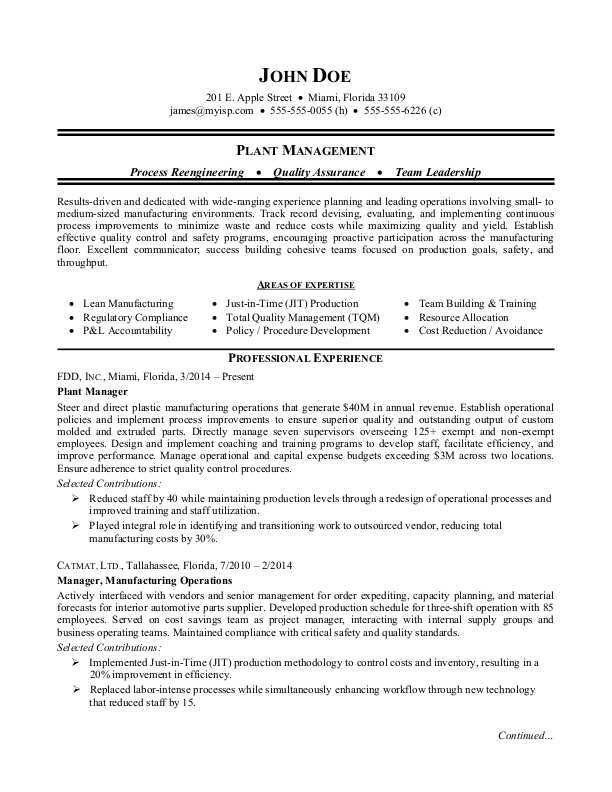 Check out this sample resume for a manufacturing manager below for ideas, and download the sample resume for a manufacturing plant manager in Word. Jobs for manufacturing managers are projected to hold steady at around 170,600 jobs, from 2016 through 2026, according to the Bureau of Labor Statistics (BLS). You'll find the highest level of employment for this job in the following states: California, Michigan, Ohio, Texas, and Illinois; and in the following metropolitan areas: Los Angeles, Chicago, Minneapolis, New York City, and Houston. As a manufacturing manager, you can expect to earn a median wage of $100,580 per year, or $48.36 per hour, according to the BLS. Additionally, you can learn more about manufacturing careers and search for manufacturing manager jobs on Monster. Results-driven and dedicated with wide-ranging experience planning and leading operations involving small- to medium-sized manufacturing environments. Track record devising, evaluating, and implementing continuous process improvements to minimize waste and reduce costs while maximizing quality and yield. Establish effective quality control and safety programs, encouraging proactive participation across the manufacturing floor. Excellent communicator; success building cohesive teams focused on production goals, safety, and throughput. Steer and direct plastic manufacturing operations that generate $40M in annual revenue. Establish operational policies and implement process improvements to ensure superior quality and outstanding output of custom molded and extruded parts. Directly manage seven supervisors overseeing 125+ exempt and non-exempt employees. Design and implement coaching and training programs to develop staff, facilitate efficiency, and improve performance. Manage operational and capital expense budgets exceeding $3M across two locations. Ensure adherence to strict quality control procedures. Reduced staff by 40 while maintaining production levels through a redesign of operational processes and improved training and staff utilization. Played integral role in identifying and transitioning work to outsourced vendor, reducing total manufacturing costs by 30%. Actively interfaced with vendors and senior management for order expediting, capacity planning, and material forecasts for interior automotive parts supplier. Developed production schedule for three-shift operation with 85 employees. Served on cost savings team as project manager, interacting with internal supply groups and business operating teams. Maintained compliance with critical safety and quality standards. Implemented Just-in-Time (JIT) production methodology to control costs and inventory, resulting in a 20% improvement in efficiency. Replaced labor-intense processes while simultaneously enhancing workflow through new technology that reduced staff by 15. Oversaw floor operations and managed four direct reports and 70+ non-exempt employees for window manufacturer. Established production schedules, defined staffing requirements, and implemented optimized procedures. Introduced manufacturing processes and promoted new technology to minimize customer costs and improve margins. Integrated new $5M product line into existing operations while reducing required staff by 12%. Directed and optimized purchasing and material control functions for supplier of tempered glass. Audited departments to ensure compliance with ISO 9000 standards; coached employees on maintaining conformance to specifications. Coordinated with engineering and floor teams to oversee design, production scheduling, and delivery of products to customers. Maintained constant communication with sales personnel to identify customer requirements and ensure highest levels of satisfaction. Although you're experienced with overseeing a complex organization, you might not have the same knowledge when it comes time to putting your resume together. Could you use some assistance? Get a free resume evaluation today from the experts at Monster's Resume Writing Service. You'll get detailed feedback in two business days, including a review of your resume's appearance and content, and a prediction of a recruiter's first impression. It's a quick and easy way to fine-tune the details and boost your resume a notch or two above the competition's.